Watch my story on the Jeep exhibit from the Portland Car Show. 5p on KATU. 48 and sunny in Lincoln City. I'm with Bob Heye doing an Officer Dodds shooting anniversary. Pics of Chip Kelly from my iPhone archives. A huge sigh of relief from Oregonians who credit Chip with much of the Ducks success. This is Wallace Marine Park in West Salem. While getting shots of some folks making a snowman, this Honda came sliding toward me on Madrona. I was able to dodge the out of control car but my temporary news Explorer got hit on the bumper. This was Tues morning. That's truck op Steve and Thom Jensen working while taking a break. These were taken Tues and Wed.
For years I drove by this house in S Salem wondering what will happen when Croisan Creek overflowed. When I took these pictures on Thursday, the homeowner was standing on dry land in his garage. It was a relief to see that no one was hurt after the waters rose quickly. Go to Salem.katu.com for latest info. Live from Rockaway Beach. This is how I've been able to keep my lens dry. I'm shooting from inside the hotel room while Thom braves the weather. Covering a dangerous situation in Portland West Hills. Turn on KATU. Did you see Nelson Park on KATU's Weather Coverage at 4? It will be on again at 5 & 6. Saw a pair of deer this morning in the backyard of this Croisan Mt. home. 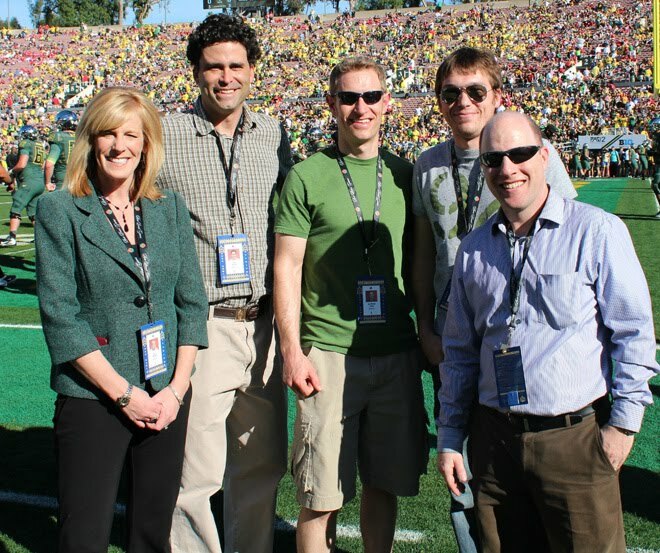 If you watched KATU's coverage of the 2012 Rose Bowl game, here is a picture of the crew that was in Pasadena. Covering these events are fun but, require working very hard under stressful, unfamiliar situations and long hours. We had great support from the folks coordinating our efforts at the station in Portland. This is a situation where a lot of things can go wrong, causing a meltdown on air. Hopefully, the live shots from the Rose Bowl were informative, insightful and entertaining to watch. 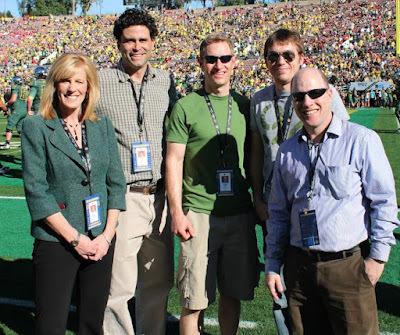 I'm back home now, ready to jump into the day to day news routine.From let to right, Katy Brown, Me, John Michael Farley, Justin Gurrad, Craig Birnbach. We are about to cross the border into Oregon. Everyone is talking about that pre game flight. That huge wing hardly made any noise. That's how my traveling partner, Justin, described this In-n-Out in Sacramento. Locals are giving us strange looks.